Life's Best Secrets: Wedding Preps Series: Half-Year Mark! Wedding Preps Series: Half-Year Mark! Since we reached the 6 months mark, I'm getting more excited and into it. I more frequently go through my checklist now and I'm more focused in getting things done ASAP. It's been almost a year since we got engaged. Aside from the materialistic wedding planning stuff, I feel that our relationship continues to grow as we happily anticipate our wedding and plan it together. It was certainly a challenge and a beautiful experience. Our event planner from Hizon's Catering contacted me the other day for the final detailing schedule. How time flies!!! It's scheduled next month. 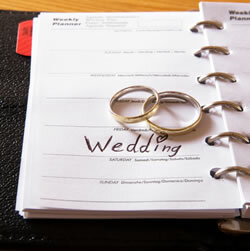 I've also locked up a date for our first meeting with our OTD wedding coordinator, Events Simplified, sometime August. I have more events at work this year and need to travel more frequent, so I make sure to accomplish as much we can while I'm in town. My main target is to accomplish the wedding requirements. I look at this aspect of the wedding planning as a tedious job, but as I review the process and requirements, it seems it is not so complicated after all. We already have all the forms needed from our church, but looks like it's still too early to get these done, so we just have to wait. Good thing the priest who will officiate our wedding is my mom's friend, so less hassle to get things signed, secure certain certificates, have misallette approved, etc. The marriage license we also need to wait until August before we can apply since it's validity is only 4 months. Now this is the waiting game. Next thing was the Growing Up AVP which I promised I will personally create. I've taken a crack on it, and actually found it therapeutic. Another important thing my friends always ask me about - wedding gown. First gown fitting: check! Groom also had his measurements taken for the suit. After almost an hour of figuring out which gray shade it should be, we finally reached a decision. And all we have to do is return next month for fitting. Outfits: almost there! We braved Divisoria today for some more items we need to get. Now I have a clearer idea of what I need, and most importantly I have a list. Got more paper doyleys at 168 Mall because I realized how versatile they are! I'm making buntings for aisle out of them, and few other things. I will dedicate a post for my beloved doyleys soon. Also got some more ribbons and laces from Yangco Market for DIY-ing. Finally bought paper lanterns for aisle and party venue which I got from 168 mall and Tabora market. The prices: 8 inches - P25, 12 inches -P35, 14 inches - P45. Got 12" for aisle and 14" for party venue. They're cheap and easy to transport and assemble. Definitely re-usable. In Yangco Market, we were also able to buy fabrics for the flower girls' dresses. Thanks to mom for helping out. For three girls, we only spent less than P500 for the fabrics! We got chiffon as main body fabric, gina as lining and satin for hemline and belt accent. In our previous Divi trip I was able to buy rose brooch for belt accent. Also got my white infinity dress in Roslim for hotel preps, and a peach one for...wala lang, personal use :) The peach shade was so charming. Other small things we bought while in Divi were: crayons (8s) at P108 for 12 boxes - these are for our children entourage to keep them entertained at the party (got coloring books during last trip), and hankies for my female entourage kit - what for? Happy tears :) I'm making entourage kits which contain all they need, including these hankies and info like roles, seating arrangement, etc., dress for ladies and ties for men. I was pretty excited making them. I feel like I have a bright future ahead of me in the wedding business ;) I will post about it after I distribute. In Tabora, we again took our chance in finding really cheap mason jars on wholsale, but failed (again). I hope it was the last time we had to set foot in Tabora, I really really hope. It's the part of Divi I hate the most. Our Divi trip would never be complete without the food tripping part - Wai Ying in 168's food court is our ultimate go-to for lunch. Lastly, I just need to thank my Mom for tirelessly supporting us. We couldn't have done this without her! She's my superwoman.